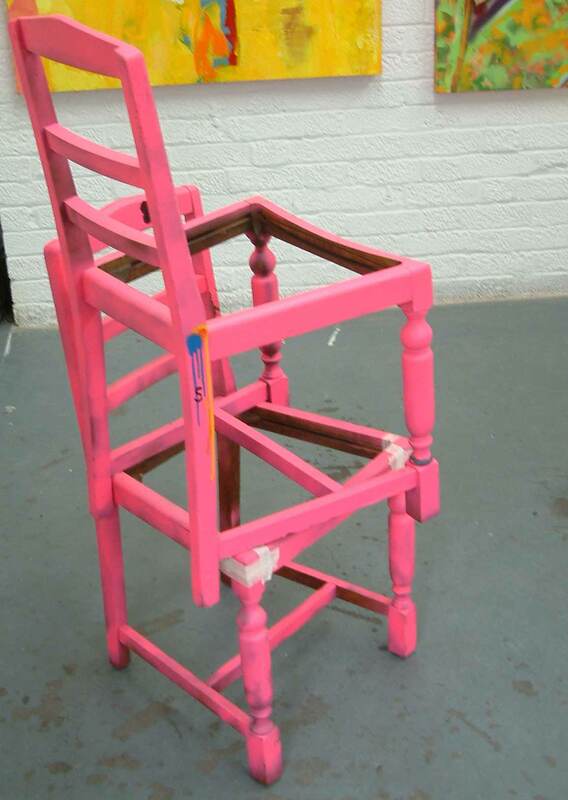 “Found pink chairs – Gallery Piece” Sean Worrall, April 2012. Saw something pink in the distance on Mowlem Street, the street just off Vyner Street, the two streets that meet on the corner that Cultivate stands on, the art re-up corner directly over from the Victory pub. Saw something pink, and everything must be investigated, might have been something worth photographing for that forthcoming show of photographs of all that art people never look at on their way to the galleries, a series of photographs I’ve been taking (and putting up on line over at Facebook) since September of last year and Cultivate’s opening. Saw something pink in the distance on Mowlem Street, turned out to be two rather vividly hand-painted broken chairs, a broken dining room table with some half formed graff on one of the leaves and another broken coffee table that looked far more interesting in terms of the art and the (French) marks on the top..
Those shocking pink chairs were on my mind though. Damn, I really shouldn’t have left them there on the street, they really were rather beautiful in their distress unwanted broken down state. Headed back down there this morning for a Saturday at the gallery and, yes, there they were, the pink blur in the distance was still there. Still left where they were last night, still there, broken chairs, unwanted on the street… Took them both back to the gallery and left them sitting outside the front door on the pavement for a bit. Sitting outside the front door, I just enjoyed looking at them for a bit, enjoying them. No one else did, people walked straight past, straight in through the gallery door – they never ever do look at the art on the street (bet they take great note of the photographs of the art on the street when we finally get around to putting the photographs of the art they never look at in to frames and up on the gallery walls, present them as art to be looked at…). 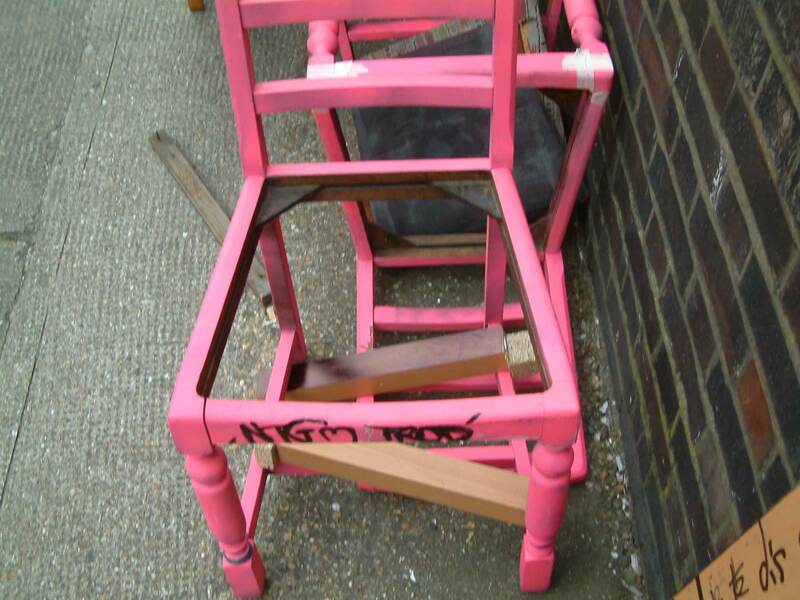 So there the chairs were, with their “NTGM Prod” black marker-pen tag on the front and their pink legs all falling apart, the unwanted bones of broken chairs, joints broken, chairs that have already been through a couple of life-cycles by the looks of things. And there the broken pink chairs stayed, out on the street, out front of the gallery, ignored on the street as the people came in to see the art in the gallery…. And the more I looked at them the more I liked them, the more I liked their shape, the more I liked their colour, their dirt, their tags, the masking tape that clearly would never hold them together. I considered spending the day drawing them (I still might). Why doesn’t anyone else look at them? Are they not art? When are a couple of broken chair just broken chairs? 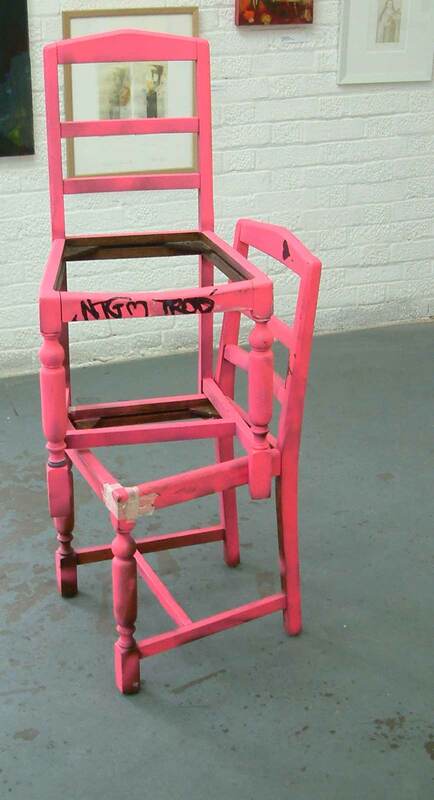 When do two broken vividly-painted pink chairs stacked on top of each other and placed in an art gallery become art? 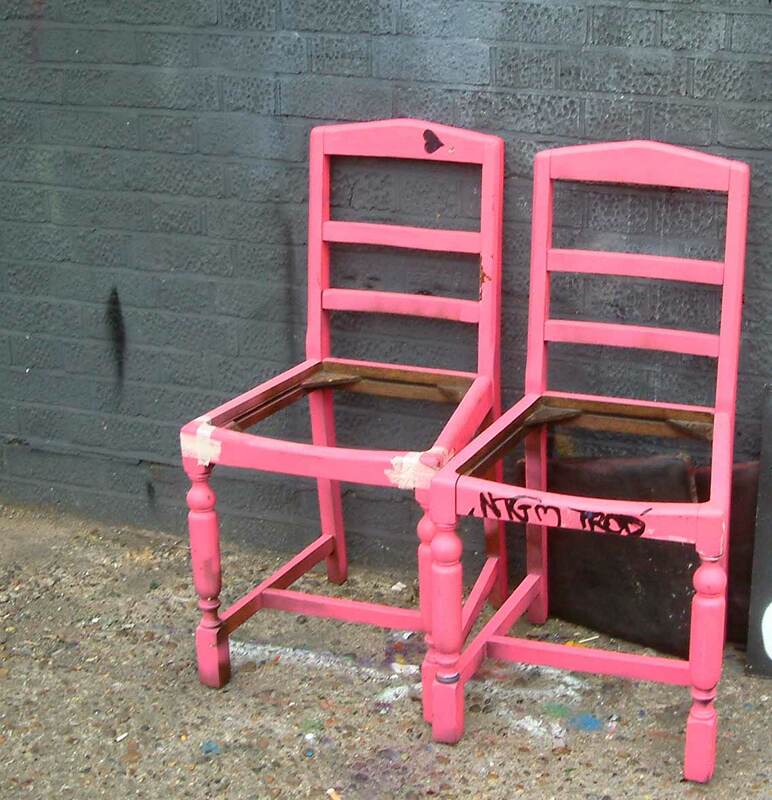 "Found pink chairs - Gallery Piece" Sean Worrall, April 2012 (£500). Not that “When do two broken vividly-painted pink chairs stacked on top of each other and placed in an art gallery become art?” is a particularly new question. No, not a new question, but it did deserved to be asked today, well I wanted to ask it. So they were carefully placed on top of each other in the middle of the gallery floor. And people started looking at them, circling around them, admiring them, asking who’s work they were, debating them. I resisted joining in most of the debate, more interesting to ‘invisibly’ listen. 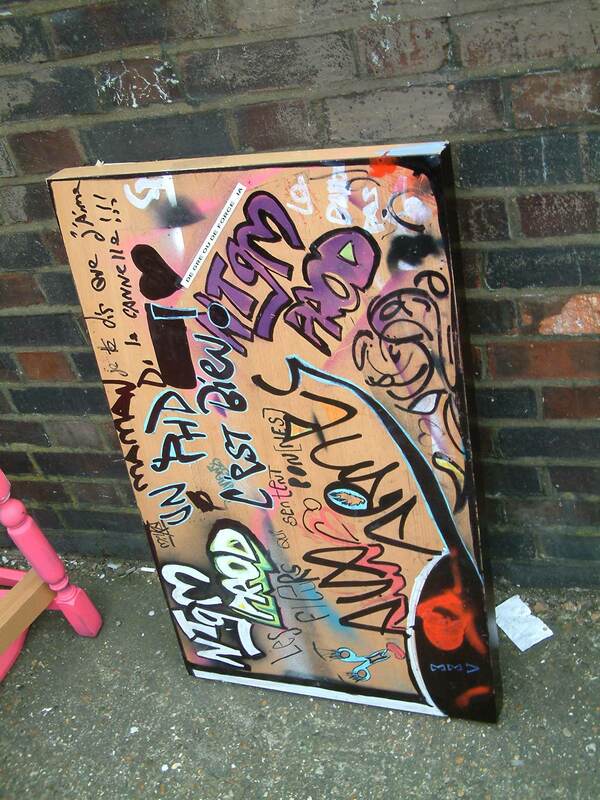 I told one man the piece had been placed there by Sean Worrall, he wrote the name down in his note book, checked the spelling and took several photos.